So you are an avid LinkedIn member who markets products and services. And you are posting in LinkedIn Groups articles you have authored and content curated from other sources to get target group member attention. Since you are marketing you want people to notice you & the products, services and solutions you offer. This Attract Attention strategy is central to content marketing and especially fits Linkedin. However it is not foolproof and there are essential things you should do and tragic pitfalls you should avoid. Here is how you can make your group posting work best. Connect with the LinkedIn Group Owner, Managers and Moderators since you may need their help in their LinkedIn Group. Read the group rules, description and statistics to see how your marketing will fit and be received. Ensure your post's Auto-Title & Description & Photo are right and the way you want them to look. Write and Include an Optional Title & Description - be authentic and interesting. Never use Auto-Posting services like Hoostuite since the Ow.ly short link says you're not really there and don't care to engage. Carpet Bombing LinkedIn Groups with your posts is a quick way to ensure that you annoy people, get put in Moderation or the nuclear option Blocked & Deleted (SWAMed) - Don't do it. 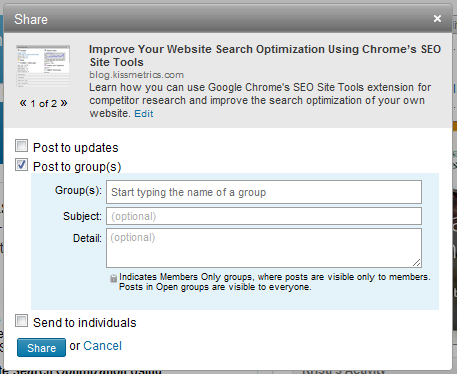 Audit your LinkedIn Group posts - go back and see if your posts are making it through Moderation, going to Promotions or just getting Deleted. You're connected to the Group Owner ask for help and instructions on what they want from you. Appending your Discussion posts - you can always add a comment to your own post to attract positive attention to the article. Again Be Interesting. Have a real point of view.. Be generous in your LinkedIn Groups by Commenting, Liking and Following other people's Discussion posts. If you liked these ideas, sign up for the LinkedIn Marketing & Advertising Tips from Franchise-Info newsletter.